New York Railroads And Railfanning In "The Empire State"
New York's rail operations are immensely rich in history and diversity (for instance, its railroads predate the Baltimore & Ohio's chartering by a year and is only behind Pennsylvania in the most route miles prior to 1840), and continues to be a vital link in the chain today. Where once railroads such as the New York Central, Delaware & Hudson, Pennsylvania Railroad, and many others moved freight and passengers to and from New York City today that service is carried on by CSX Transportation, Norfolk Southern Railway, Canadian National, and Canadian Pacific (along with numerous commuter operations in and around the New York City region). Outside of New York's largest city, however, one can still find numerous shortline operations all across the state, nearly two-dozen to be exact! 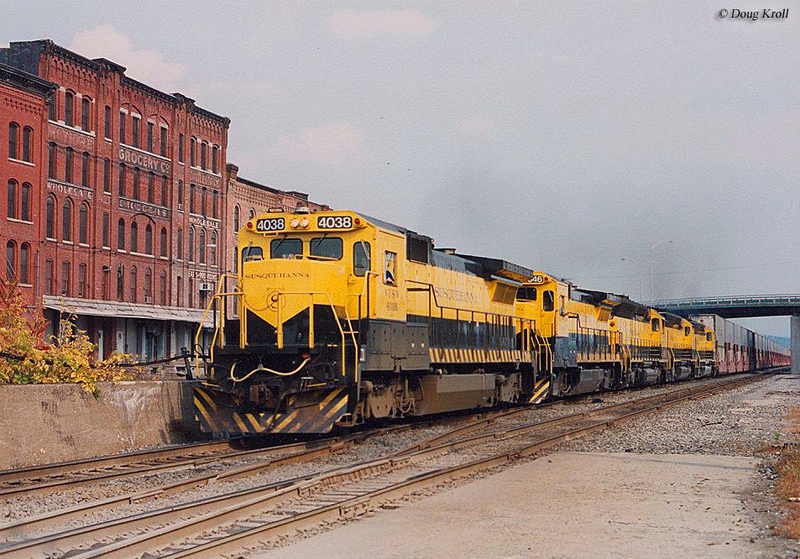 The diverse history of the state's railroads is far too deep to cover in a single article. However, hopefully after reading through it you will at least have a better understanding of New York's past, and present, with trains and how they have come to shape the state. New York railroads date back to 1826 when the Mohawk & Hudson (a future subsidiary of New York Central) was chartered to build a railroad between Albany and Schenectady to connect the waterways of the Hudson and Mohawk rivers (remember that this was during an era when river transport ruled and was the most efficient way to move people and goods). 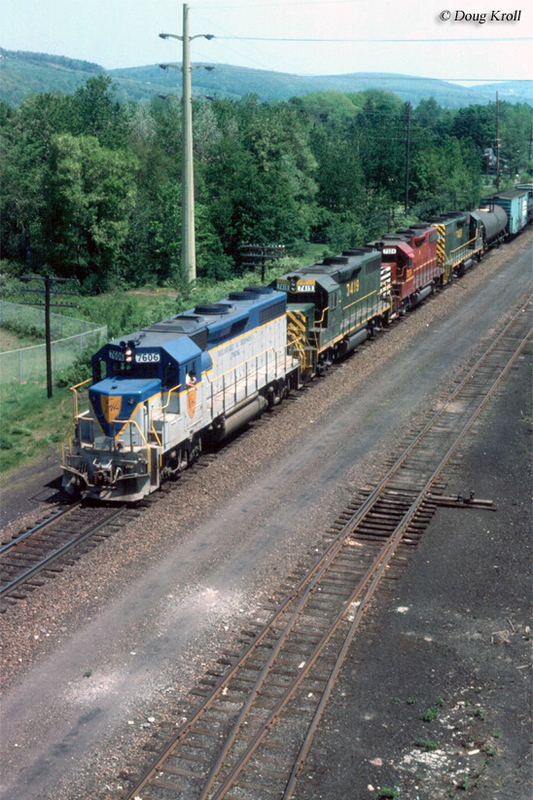 One of the reasons for the railroad's construction was to provide for another transportation option as the Erie Canal was not yet completed). Interestingly, the M&H was one of the few such companies to be named solely after waterways with no city or state as part of its name (the Delaware & Hudson was another, incorporated at around the same time). The Mohawk & Hudson was able to complete its main line in about five years, opening service to the general public on September 24, 1831 originally using horse power to pull its trains. Following the completion of the Mohawk & Hudson, New York would be home to a entire slew of celebrated railroads by the early 20th century the most famous of which included the New York Central and Pennsylvania Railroad. 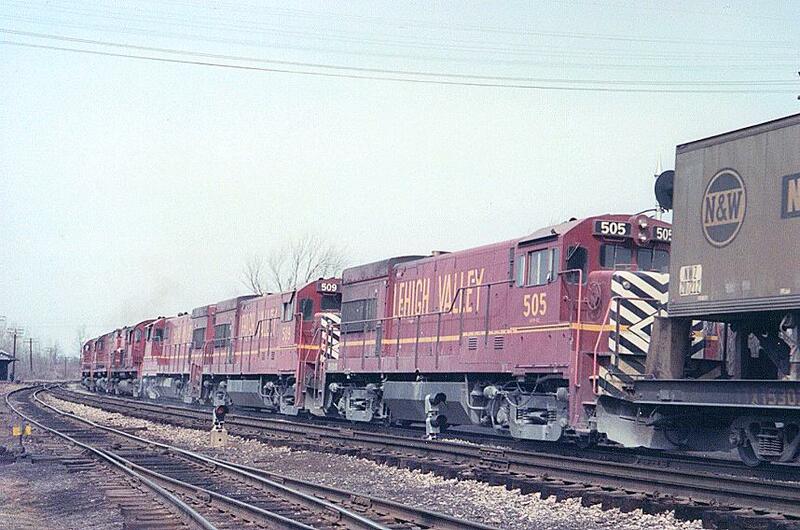 However, these two were certainly not the only railroads to operate within the state. Today, New York is still home to considerable container traffic albeit under the CSX and Norfolk Southern banners, which move the freight between New York and Chicago. Additionally, as mentioned above, Canadian Pacific and Canadian National both also operate lines into New York via control or ownership of former US systems. 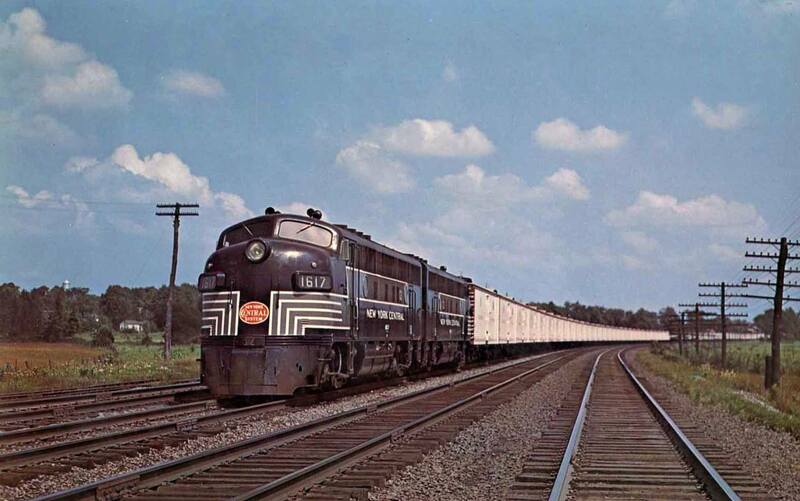 New York railroads also feature a dizzying array of smaller lines including regionals (Class IIs) NYS&W (mentioned above), Buffalo & Pittsburgh Railroad, Pan Am Railways and Providence & Worcester along with shortlines Albany Port Railroad, Arcade & Attica Railroad, B&H Rail Corporation, Batten Kill Railroad, Buffalo Southern Railroad, Central New York Railroad, Clarendon & Pittsford Railroad, Depew, Lancaster & Western Railroad, Falls Road Railroad, Fingers Lake Railway, Housatonic Railroad, Livonia, Avon & Lakeville Railroad, Lowville & Beaver River Railroad, Massena Terminal Railroad, Middletown & New Jersey Railroad, Wellsboro & Corning Railroad, and many more. Today, New York is home to about 3,500 miles of track, which is a far cry from the 8,400 miles during the industry's heyday era of the 1920s. With a loss of 58% of its rail infrastructure, New York is well above the state average of between 45%-50%. This can mostly be explained by the nature of the Northeast itself, which after World War II was simply too overpopulated with railroads. In other words, as manufacturing centers moved either to different areas of the country or overseas and as highways, automobiles, and air travel became faster and more efficient the traffic in the region could no longer support the amount of rail lines serving it. 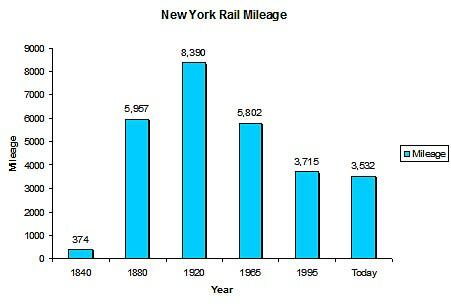 For more in-depth information about New York's rail mileage over the years please refer to the chart below. As for passenger and commuter operations, well, just take your pick! While the 20th Century Limited may no longer skirt the Water Level Route and call at Grand Central Terminal, and the Broadway Limited may no longer call from Penn Station but Amtrak continues to serve the Northeast Corridor (which runs directly through NYC and the southeastern corner of New York) and operate several passenger trains in, around and through New York State. 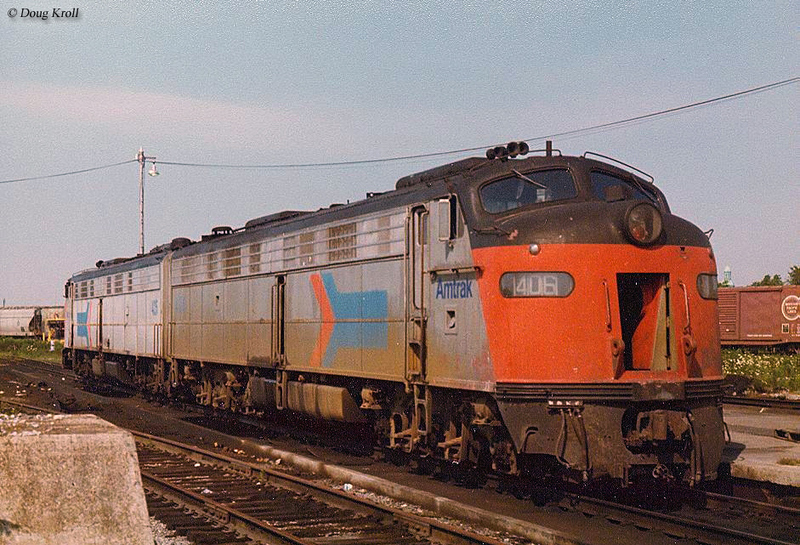 Some of these services include the Lake Shore Limited between Boston-NYC-Chicago, Empire Service between NYC-Albany-Niagara, the Maple Leaf to Toronto, the Adirondack to Montreal, and the Ethan Allen Express to Rutland, Vermont. Aside from Amtrak there is the NJ Transit, PATH and MTA services, the latter two of which are the country's busiest commuter/passenger and subway railroads. If you thought that New York included plenty of freight and passenger trains, you should just see the excursion trains and railroad museums! New York is home to nearly two-dozen museums or tourist lines, the latter of which is operated by some of the state's shortline freight carriers as well. There are far too many to name here but some include the Catskill Mountain Railroad, New York Museum of Transportation and the Empire State Railway Museum. Other interesting features of New York includes the American Locomotive Company's famous Schenectady Works, NYC's regal Grand Central Terminal and the PRR's late Penn Station (the underground station still remains but the above building was demolished in the late 1960s). All in all the state offers about any interest you may have in the hobby of railfanning from history to main line freight railroading. And, don't expect to see everything in one visit because that won't happen! A planned trip to focus on one or a few things you're interested in is probably the best route with future trips to see more at a later time. In any event, with so much to see and do, you shouldn't have any trouble having a wonderful and memorable time!